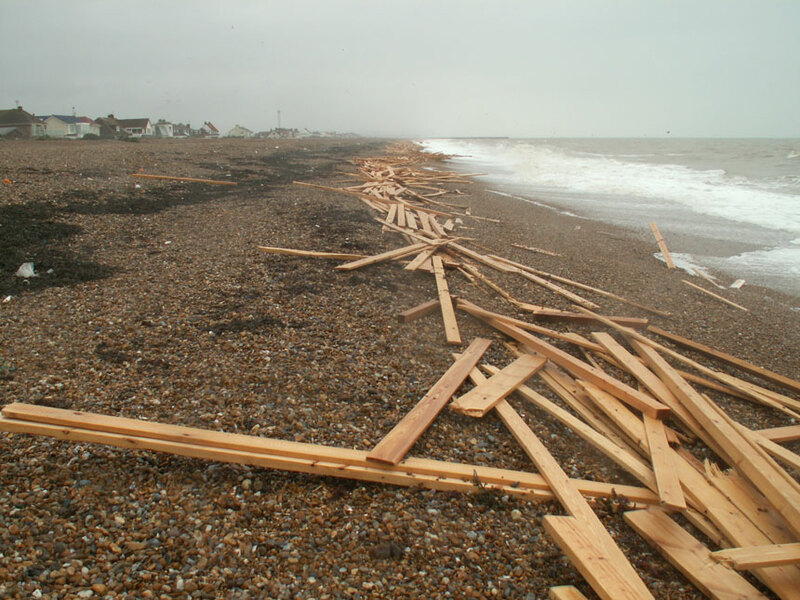 The extent that the tide will move up the shore will be marked with a strandline of seaweeds and other debris on the shingle and some of the rocky beaches. If this strandline is not present, the limit of the rising tide has to be deduced from the position of the Barnacles and Limpets on the rock. These animals need to immerse themselves in seawater to feed, but can go for days without feeding when the tide does not come up far enough. When the tide goes out the Acorn Barnacle closes its limestone plates, and the Limpet clamps its shell hard down on to the rock to keep in the moisture until the next high tide. 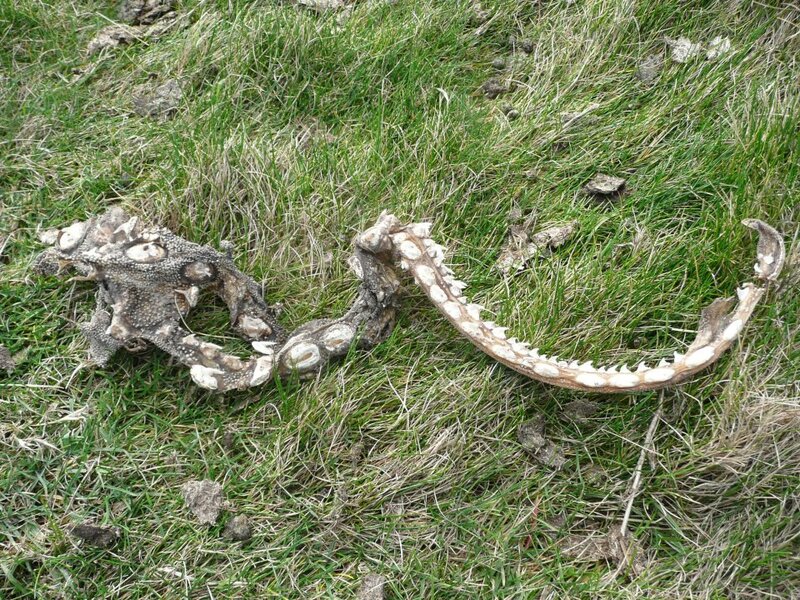 Can you identify the remains of this animal that is occasionally washed up on the strandline in Sussex? 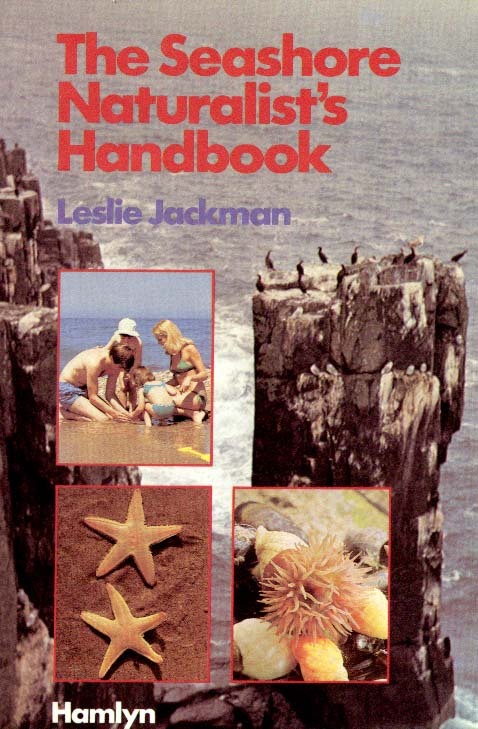 Children can collect seashells washed in by the tide and deposited on the strandline. 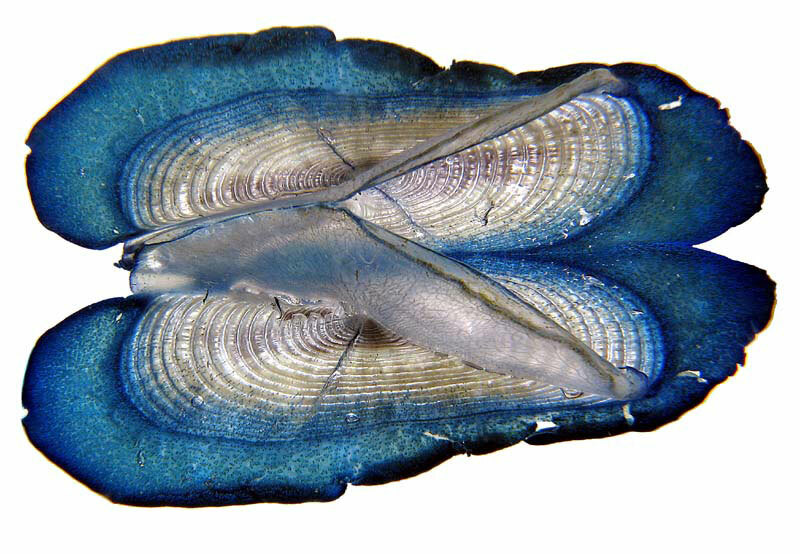 The two halves of mussel shells are the commonest; they are dark blue on the outside with a pearly white interior. 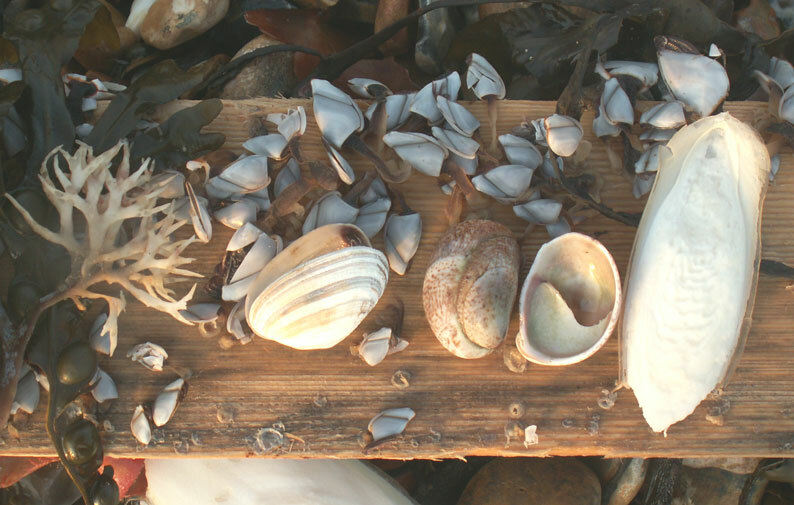 However, on southern coasts the creamy-white slipper limpets are also easy to find, their white slipper-like shells contrasting with the darker pebbles. In an hour or so the diligent searcher should be able to find a handful of different marine snails. On closer examination it was found to have a cavity at one end and tucked into this was a male and a female Columbus Crab, Planes minutus. 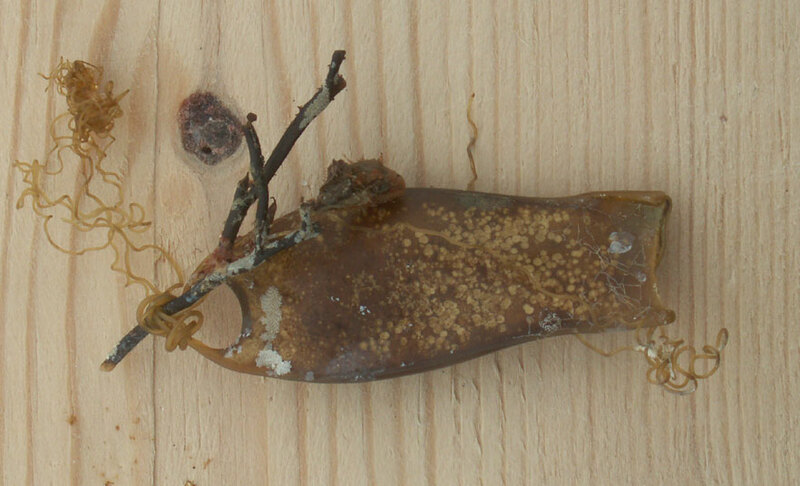 Small 3-4 mm egg masses and shipworm holes were also seen which included the rarely recorded Bankia gouldi; as well as Teredora malleolus, which made up about 95% of the shipworms in the timber. Under a magnifying glass and discovered a rare 14 mm pelagic sea slug,Fiona pinnata, which has only been recorded a few times in British seas. 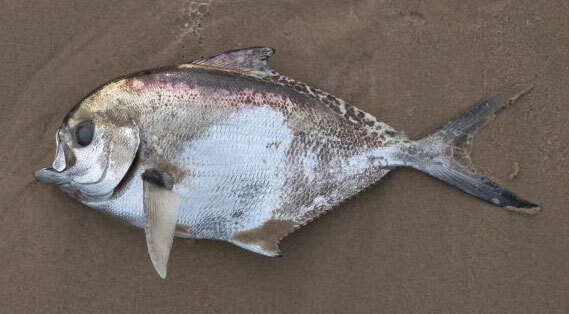 A Grey Triggerfish, Balistes capriscus, measuring 23 cm long, was washed up on the shore of the Gann Estuary near Dale, Pembrokeshire. It was found on a particularly windy day, with substantial wave action on the northern shores of the Milford Haven Waterway. 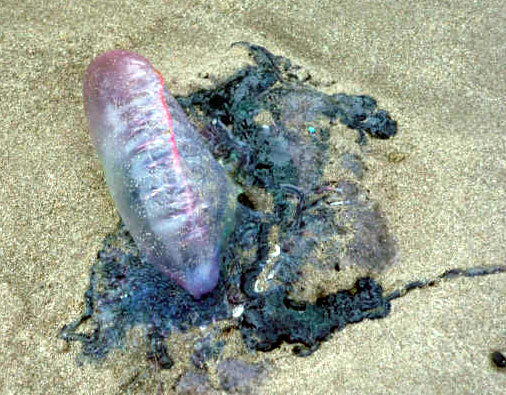 Portuguese Man-o'-War, Physalia physalis, and Mauve Stingers, Pelagia noctiluca, as well as Goose Barnacles, Lepas anatifera, were discovered washed ashore at Kennack Sands, on the eastern shore of the Lizard Peninsula, south Cornwall. A mass stranding of crabs occurred on the Isle of Thanet coast, Kent; about 40,000 Velvet Swimming Crabs, Necora puber, were discovered on the strandline amongst lesser numbers of molluscs, sea anemones, sponges and other washed up invertebrates. The most likely reason for this mass death was hypothermia. An unprecedented stranding of over a hundred Barrel Jellyfish Rhizostoma octopus were discovered on the beach at Formby, north Liverpool. "The jellyfish were literally uncountable - we walked about a mile along the beach and they stretched the whole way and out of sight. They were all more than 60 cm in diameter. The previous high tide was accompanied by a moderate wind but nothing exceptional, and it was not particularly high." 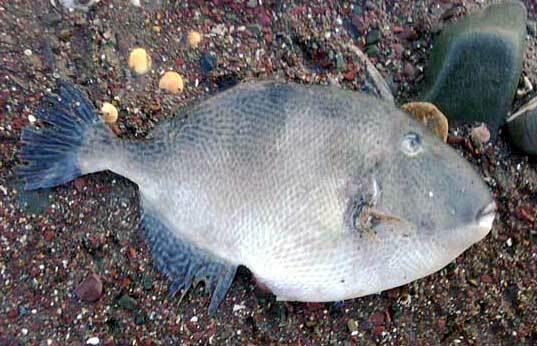 A Ray's Bream, Brama brama, was washed ashore at Portobello Beach, Edinburgh. 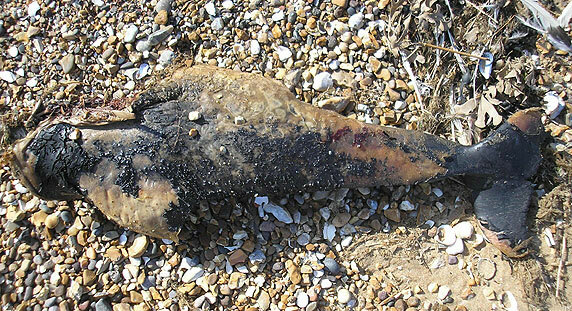 The carcass of a baby cetacean was washed up on the shore at South Heacham Beach, Norfolk. It was about a metre long and the skull about 23 cm. It is most likely to be a baby Harbour Porpoise, Phocoena phocoena. I made a wonderful but sad discovery as I walked along the pebbles at Chesil Cove, Dorset. 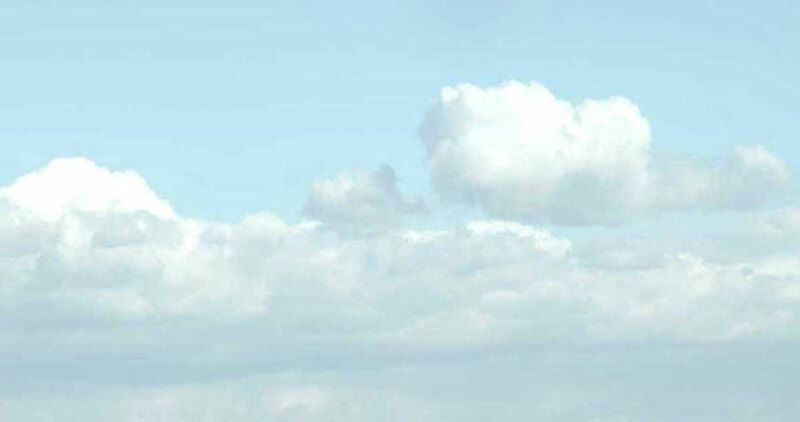 At first, I could not take in what I was looking at because it looked, somehow, so artificial – like a large model or toy. This exquisite creature was a newly born (neonatal) Risso’s Dolphin, Grampus griseus. 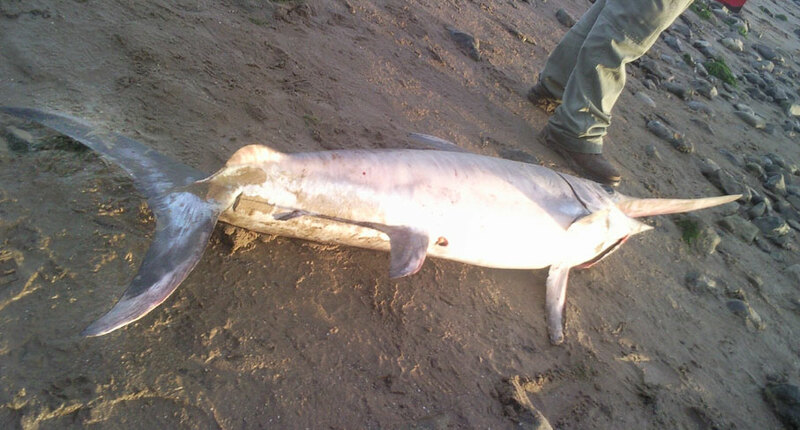 The stranded body of this small dolphin was about 1.3 metres long. It looked unlike any dolphin I had ever seen before and was clearly not a Common or Bottle-nose Dolphin as it had no ‘beaked’ snout. 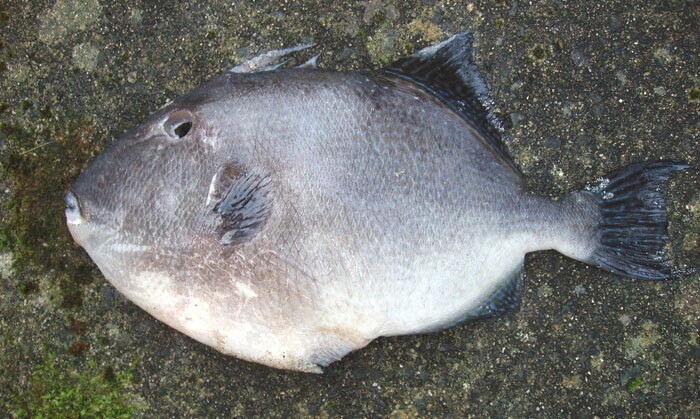 The odd shape of the head is characteristic of this species as also with the dorsal fin, pectoral fins and the tail flukes. Flung ashore by huge waves, it was virtually unmarked but for a few grazes and scratches on head and under-belly. The smooth, cold, rubbery skin shaded from almost black, through grey and tan to near white; unblemished and scarless with just a few fine lines and creases where the fins articulated with the body and in the places most stretched – like the jaw line. Apparently the broader barely perceptible marks along its sides are foetal folds and the chief indicator that it had recently been born. Thousands of Common Starfish, Asterias rubens, were washed up on the strandline on the shingle beach at Budleigh Salterton in south Devon (East Devon AONB). 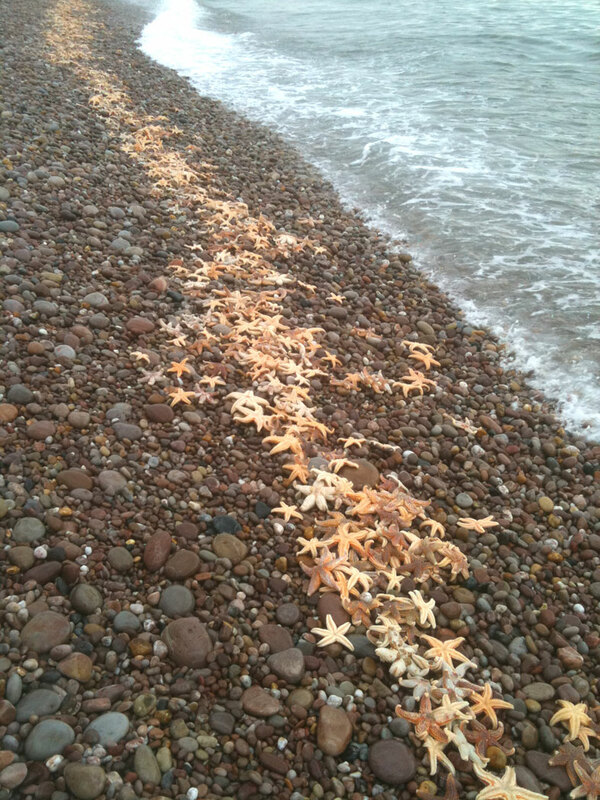 The line of washed up starfish stretched for over a mile. 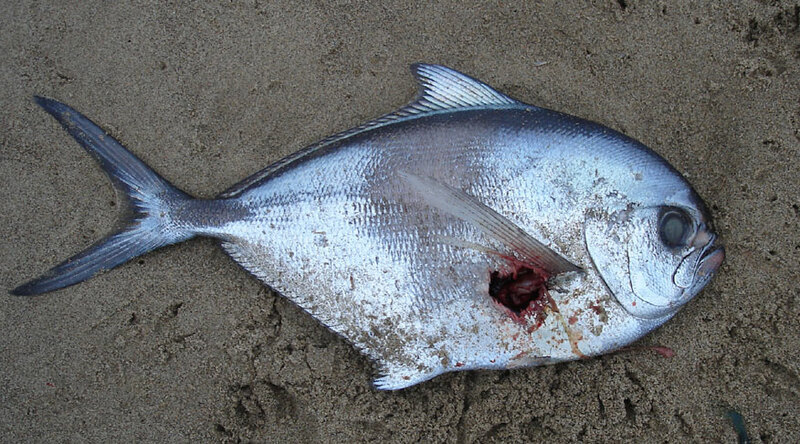 At least fifty Ray's Bream, Brama brama, were discovered over a period of a few weeks by the beach cleaning staff between Roker and Seaburn, at Sunderland, Wearside, north-east England. A mass stranding of crabs occurred on the Isle of Thanet coast, Kent; the crabs have been reported on beaches at Westbrook, Cliftonville and Kingsgate, while smaller numbers have been washed up between Broadstairsand Ramsgate. Most of the crabs were the Velvet Swimming Crab, Necora puber, which inhabits the shallow seas beneath the intertidal zone, over rocky substrates. 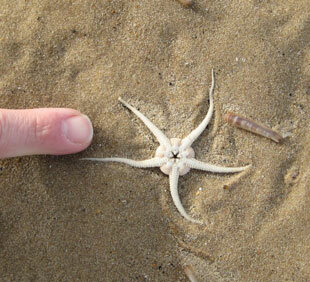 We discovered two Sunstars, Crossaster papposus, on the beach at Winthorpe, Lincolnshire. We have never seen these before on this coast although the five legged Common Starfish, Asterias rubens, are quite common. 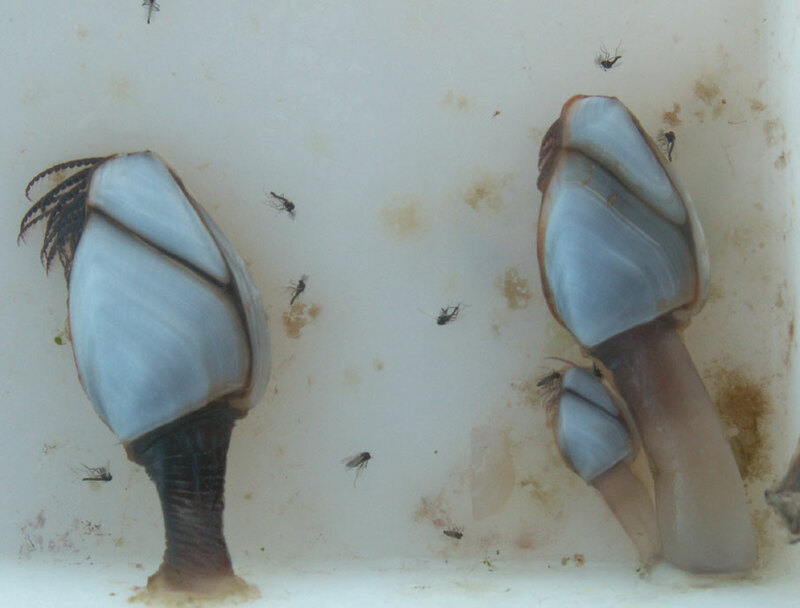 Strong south-westerly winds have blown many organisms on to Dorset beaches including the unusual pelagic Striped Goose Barnacle, Conchoderma virgatum, and at Ringstead Bay, near Weymouth a tiny Columbus Crab, Planes minutus, was discovered. Four species of Stalked Barnacles:Lepas anserifera, Lepas hilli, Lepas pectinataandLepas anatifera. About 5:00 pm on the shore of Barry Island beach, Vale of Glamorgan, South Wales, a chap spotted a fin sticking out of the water and hauled in a dead Broad-billed Swordfish, Xiphias gladius, watched by a swarm of congregating gulls. 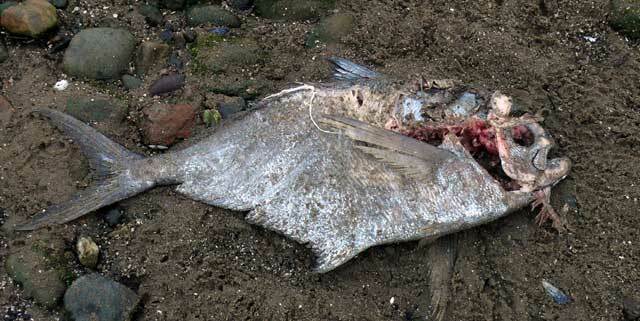 The last British report was also washed up on Barry Island in July 2008. They are often called a Broad-billed Swordfish, but there is only one species in the world. They are found throughout the tropical and temperate waters of the world but appear to prefer sea temperatures of 18° C to 22°C, migrating to cooler waters to feed in the summer. 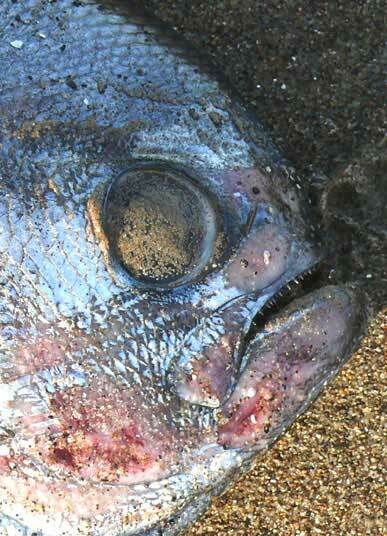 These oceanic fish chase herring and mackerel and are among the fastest fish reaching 90 km.h-1 (56 mph). This is in part due to their being warm-blooded, which allows not only their muscles but also their brain and eyes to work more efficiently. 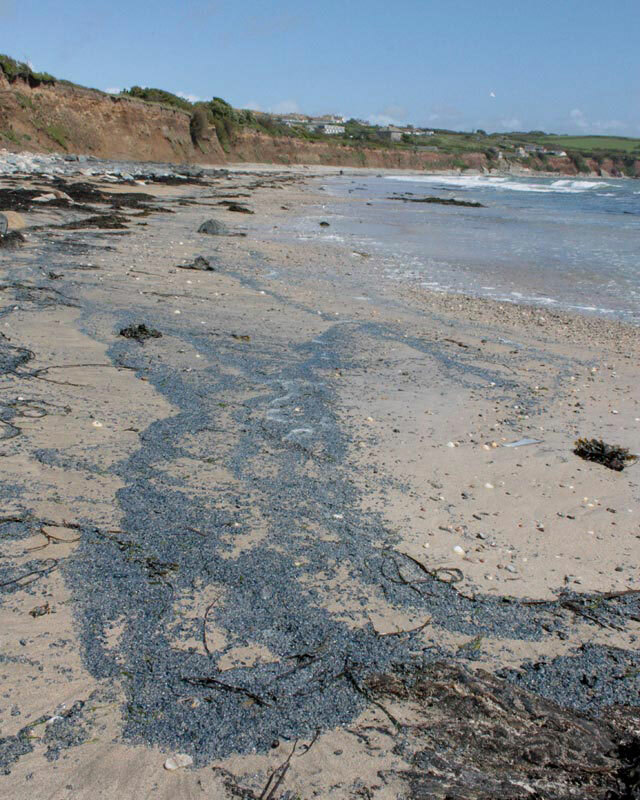 A large wreck of millions of By-the-Wind Sailors, Velella velella, started getting washed ashore and extended, at least several miles east from Penzance, south Cornwall. The specimens are very small, only a few millimetres in length. More Velella arrived on each tide. Billions of krill-like pelagic Hyperiid Amphipods (small crustaceans) were washed up on the strandline at Redcar and Saltburn in north-east England (North Yorkshire). The local people reported that the strandings of amphipods have occurred for several weeks prior to this report. 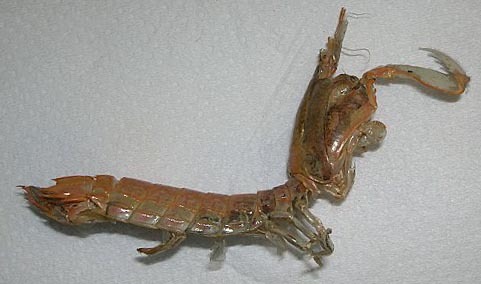 A previous mass stranding of amphipods occurred on the North Sea coast in 1966. 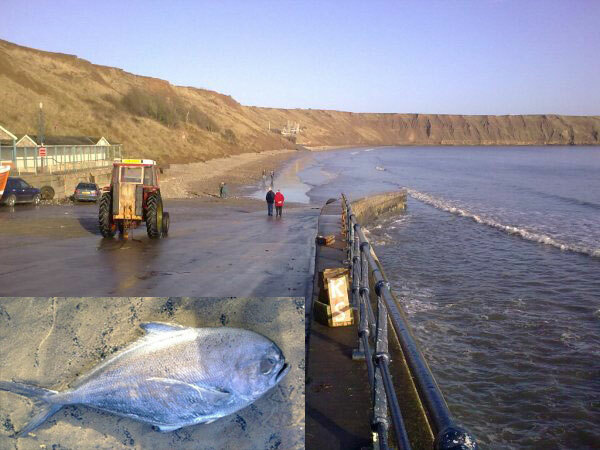 Thousands more were discovered washed up at Whitby in North Yorkshire. 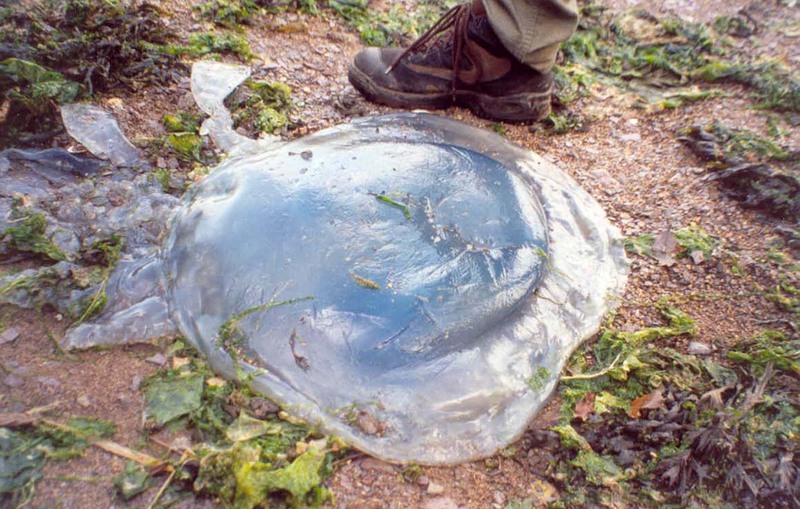 About 50 specimens of the Bluefire Jellyfish, Cyanea lamarcki, were washed up on Havelet beach, on the south side of St. Peter Port, on the east coast of Guernsey and recorded at 5.19 pm. The jellyfish in the image measures about 30 cm across but most were much smaller. 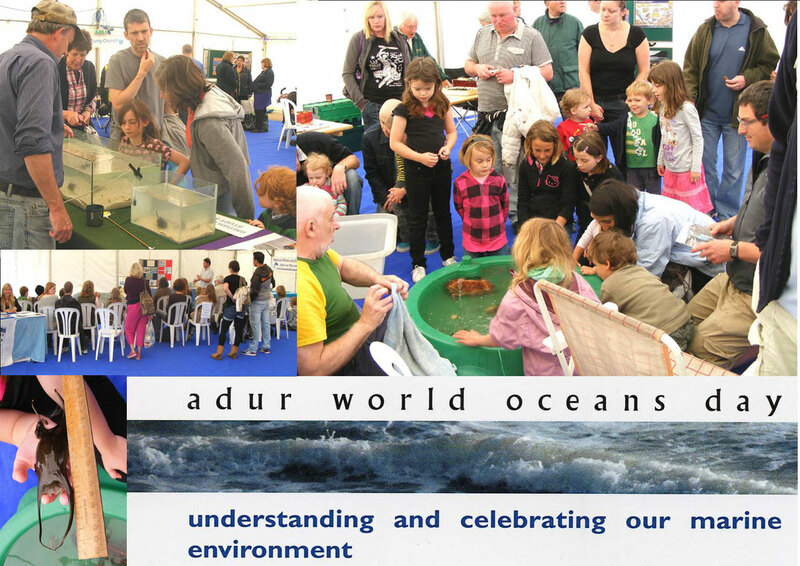 Adur was one of the UK leaders in presenting the eleventh environmental exhibition of World Oceans Day on Coronation Green, Shoreham-by-Sea. Adur World Oceans Day took place in the marquee on Coronation Green on 6th June 2009 on the opening Saturday of the Adur Festival. Len Nevell was there with the usual exhibition of lobsters and crabs. The innovative aquarium displays of seashore life, strandline exhibits and photographs will again be in on show. Experts will be on hand to answer your queries about life in the oceans and on the seashore. The Friends of Shoreham Beach played an important part with their own displays and information about the Nature Reserve and plants of the shingle beach. Adur World Oceans Day is run by a committee comprising representatives of the British Marine Life Study Society, West Sussex County Council, the Sea Watch Foundation, Friends of Shoreham Beach and other groups, with support from Adur District Council. World Oceans Day was declared at the Earth Summit in 1992. An unusual discovery washed up on the shore at Hauxley near Amble in Northumberland on the north-east coast of England was the decaying remains of an Oarfish (or Ribbon Fish), Regalecus glesne. 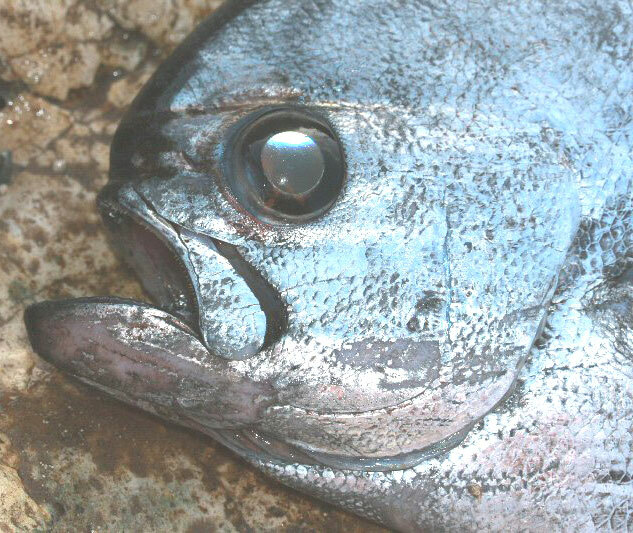 This is a deep water species and the longest fish found in the oceans reaching a length of 11 metres. The last known British record was from Skinningrove, Cleveland on the north-east coast in 2003. 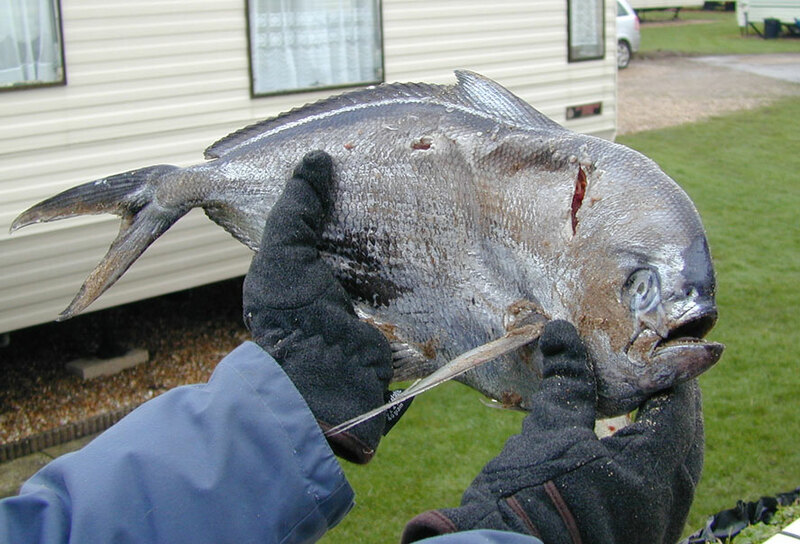 Ray's Bream, Brama brama, continue their strandings on the east coast of England and Scotland. Most of them are found dead on the beach, intact or scavenged by gulls, whilst occasionally they are discovered alive flapping in the shallow water surf. 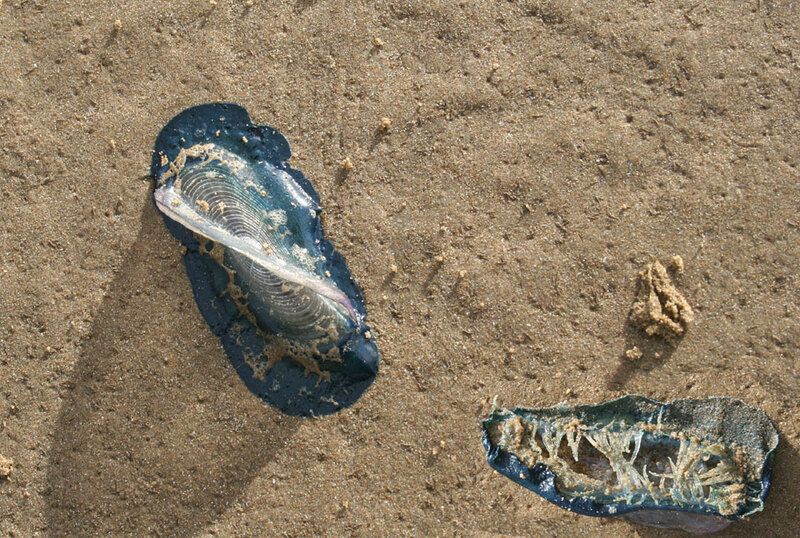 Portuguese Man-o'-War, Physalia physalis, washed up on Pendine Sands in Carmarthenshire, south Wales. 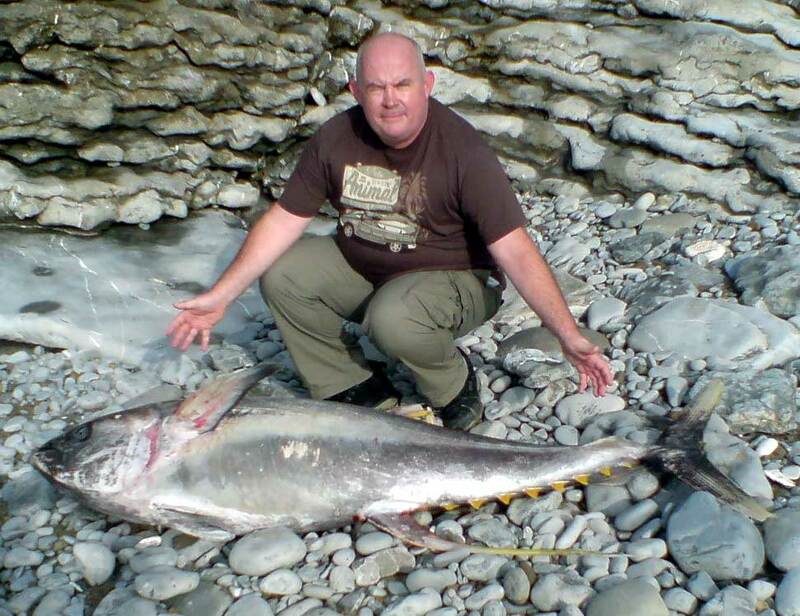 A Broad-billed Swordfish, Xiphias gladius, was discovered washed up dead on Barry Island beach, Vale of Glamorgan, South Wales. It was carefully examined by Dr Peter Howlett, (Curator of Lower Vertebrates, National Museum, Wales) who confirmed the identification and found it to be a young specimen 2.24 metres long and between 60 and 80 kg in weight. It had been dead only a few days, but it had been scavenged by other creatures and it was not possible to determine the cause of its death. 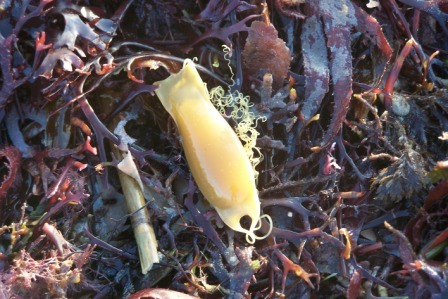 There has been at least half a dozen reports of Squid eggs frequently washed up on the shore along the English Channel coast. After a recent bout of northerlies in North Wales I took the dog for a walk down on Red Wharf Bay on Anglesey and found all sorts of things washed up. Much of the material was deposited across the entire intertidal to the east of the bay, but more concentrated on the strandline towards the west. Brittlestars (various species) were particularly abundant on the upper shore, with patches a couple of inches (or more) thick. Common Starfish, Asterias rubens, were also very abundant, as a rough guess at 5-10 per square metre. Species such as the Sand Starfish Astropecten irregularis, Heart Urchin Echinocardium cordatum, Dead Men's Fingers Alcyonium digitatum, Masked Crabs, Corystes spp., and various sipunculids (Peanut Worms)were also washed up in considerable numbers, as were various shark and ray eggcases, a couple of which I brought back to ID. 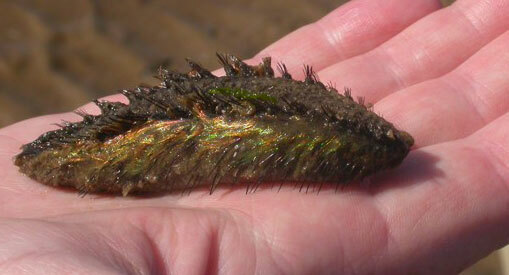 Of the more unusual species, I found three Angular Crabs, Goneplax rhomboides, a small Conger Eel (approx. 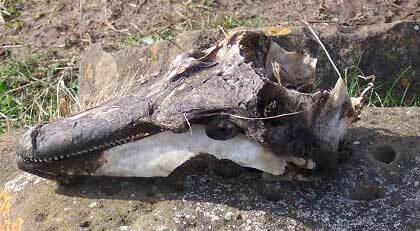 50 cm long) and a dead Chough, Pyrrhocorax pyrrhocorax. Over Easter, after some heavy storms with snow blowing in off the North Sea, I discovered hundreds of thousands of Razorfish, Ensis sp. 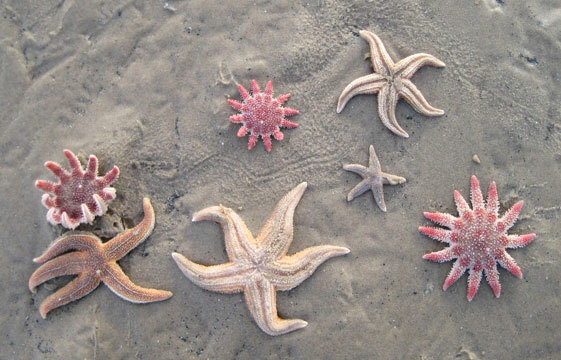 (a bivalve mollusc), hundreds of Common Starfish, Asterias rubens, lots of Sunstars, Crossaster papposus, and Brittlestars washed up on the sands of Holkham Beach. 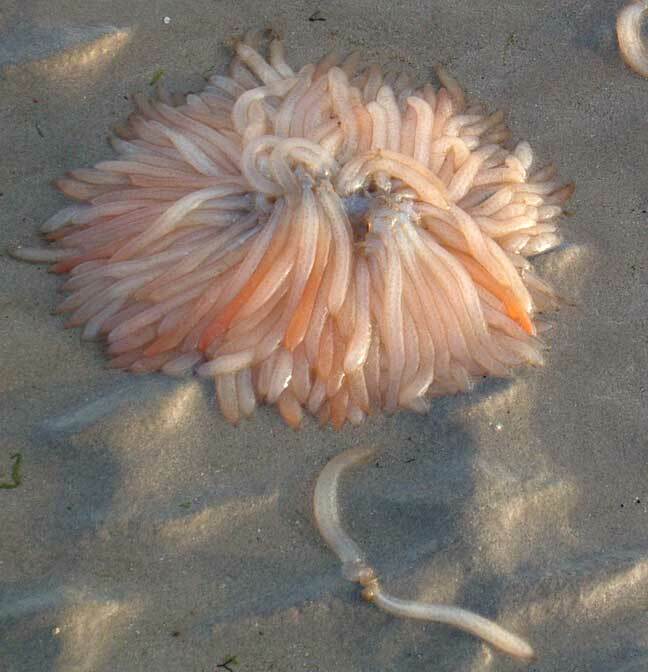 Hundreds of the sea cucumber Thyone fusus, many exuding their guts and gonads as a response to the stress, were discovered washed dead on up on the shore Newborough in North Wales (only a few nautical miles from Dinas Dinlle). After the recent storm there was a mass stranding on Lancing Beach east at low tide. I braved the chill westerly breeze and found the usual 'Mermaid's Purses' Dogfish Eggcases (including three with embryos seen inside), Ray Eggcases, orange and white sponges, Whelk shells and eggcases Buccinum, and also hundreds of dead sea anemones, including dead and alive Snakelocks Anemones, Anemonia viridis. and larger Dahlia Anemones, Urticina felina. 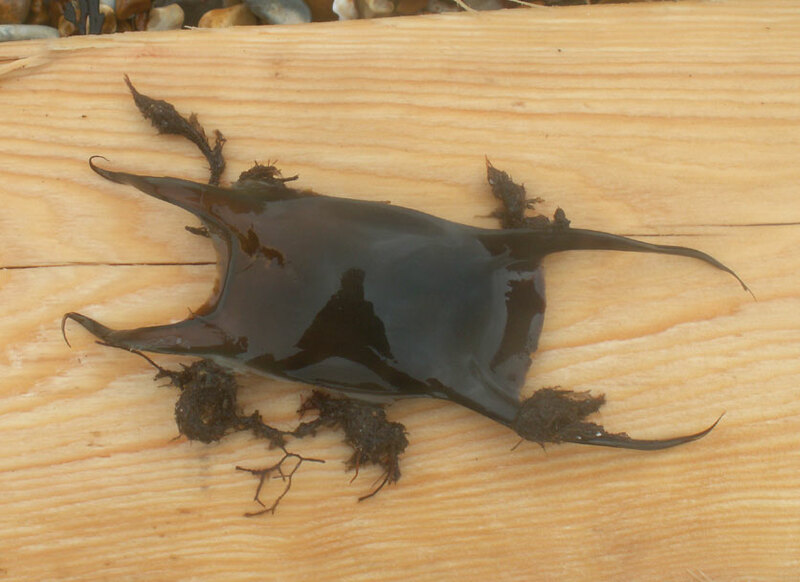 Two 'Mermaid's Purses', containing the eggs or young of the Lesser-spotted Dogfish, Scyliorhinus canicula, were found lying amongst the timber and seaweed debris on the strandline of Shoreham Beach. 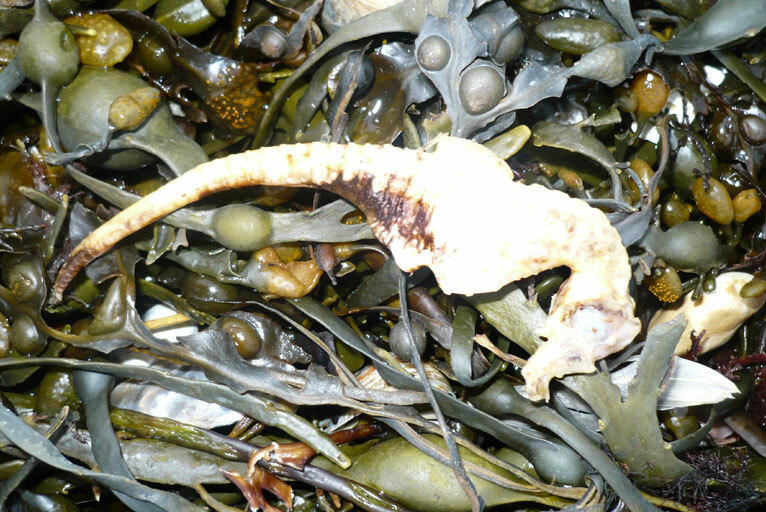 A dead Short-snouted Seahorse,Hippocampus hippocampus, was discovered by Craig Vernoit on Brighton Beach just to the east of Brighton Marina amongst tonnes of timber from the Greek-registered Ice Prince. 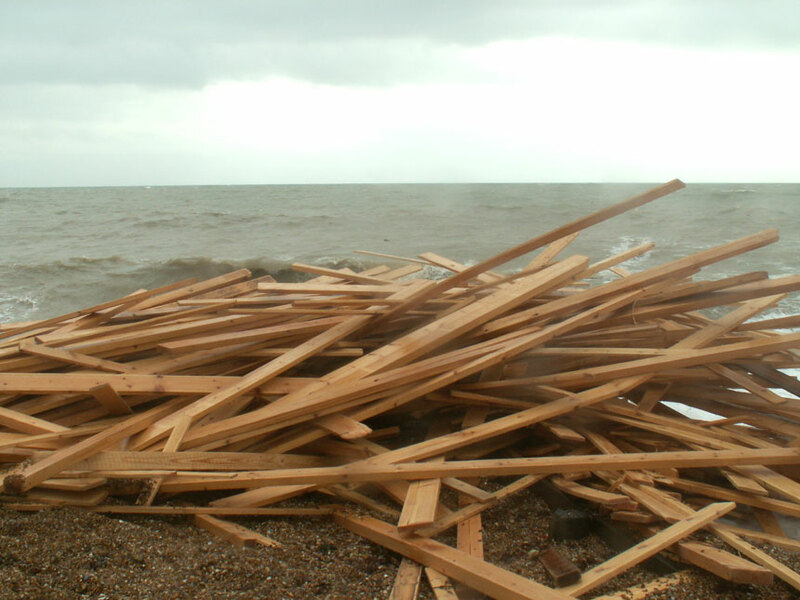 Timber from the Greek-registered Ice Prince, which sank about 26 miles (42 km) off Dorset after a storm on 15 January 2008, began getting washed up on Worthing Beach in the evening of 18 January 2008 and and tonnes of pine planks littered theSussex beaches from 20 January 2008. 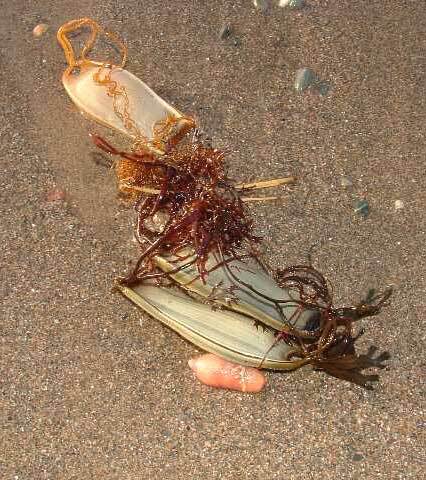 The usual debris was on the strandline including the eggcase of an Undulate Ray, Raja undulata. It measured 67 mm long and 48 mm wide. 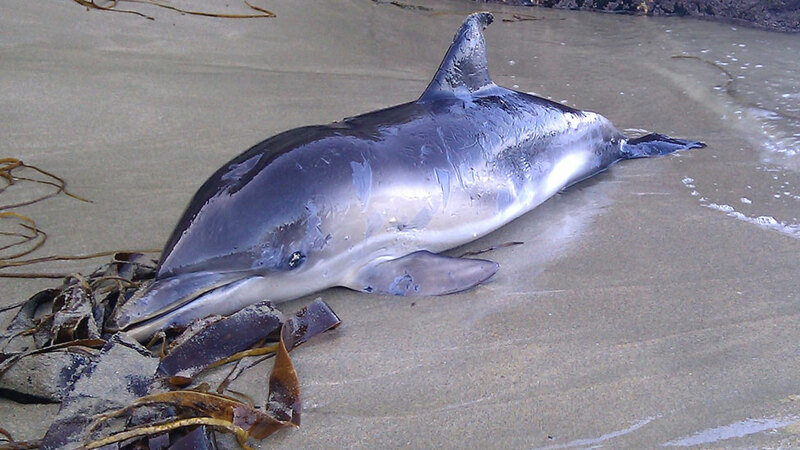 A Bottle-nosed Dolphin, Tursiops truncatus, was washed up dead west of Brighton Marina. The huge 276 metre long container vessel Napoli was deliberately grounded one mile off Branscombe Bay, Lyme Bay, Devon, on the Jurassic Coast World Heritage Site. 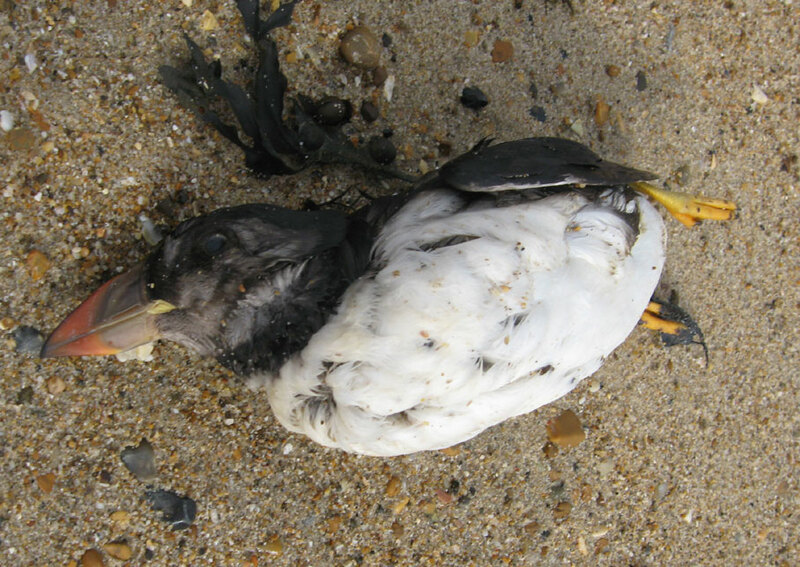 The ship contained 1650 tonnes of fuel oil plus diesel and some of this leaked over the following days causing an oil slick several kilometres long and fatally oiling at least 600 sea birds, mostly Guillemots in the first four days. 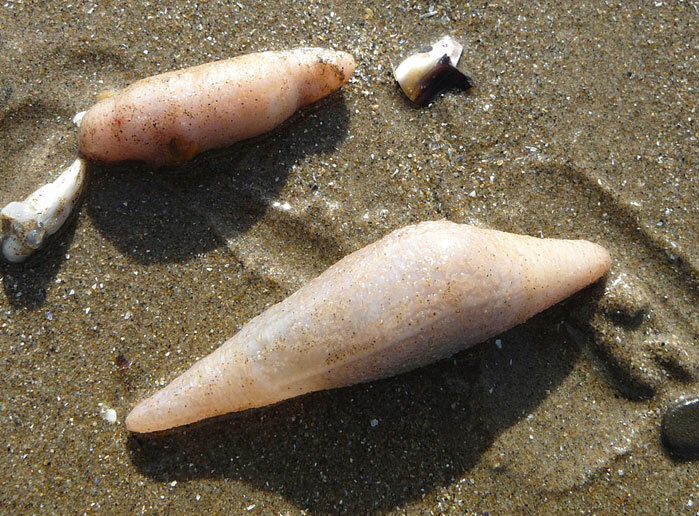 Both species of Violet Sea Snail, three Janthina janthina and one Janthina pallida with the cuttlebones of all three species of cuttlefish were discovered on the beach at Perranporth, Cornwall, (SW 75). The species were the Common Cuttlefish, Sepia officinalis, the Elegant Cuttlefish, Sepia elegans, and Obigny's Cuttlefish, Sepia orbignyana. 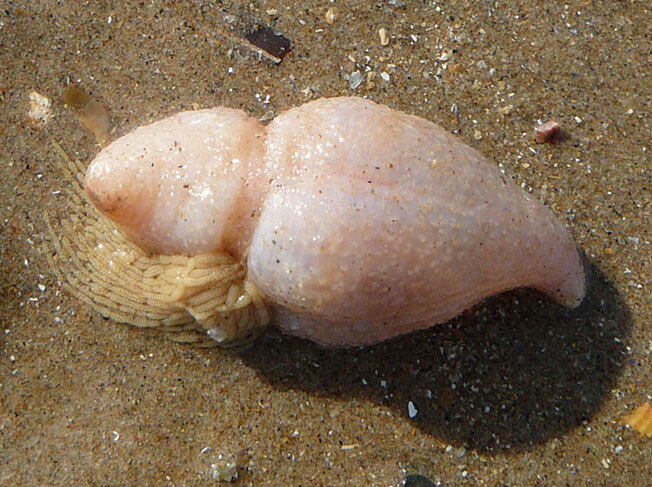 At Gwithian beach, Cornwall, (SW 54), 15 Violet Sea Snails, Janthina janthina, with three dead Triggerfish, Balistes capriscus, and one Nightlight Jellyfish, Pelagia noctilica, were discovered on the strandline. 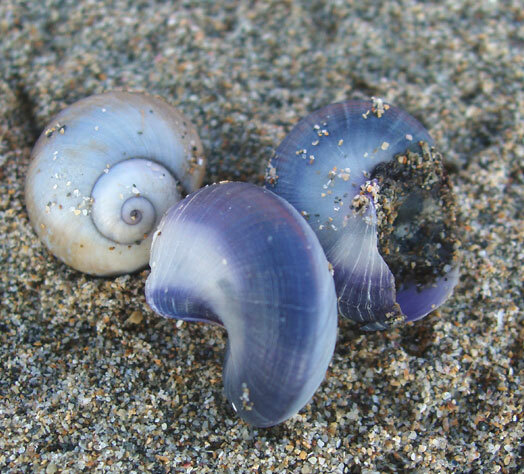 Three Violet Sea Snails, Janthina janthina, were discovered on Marazion beach in south Cornwall. 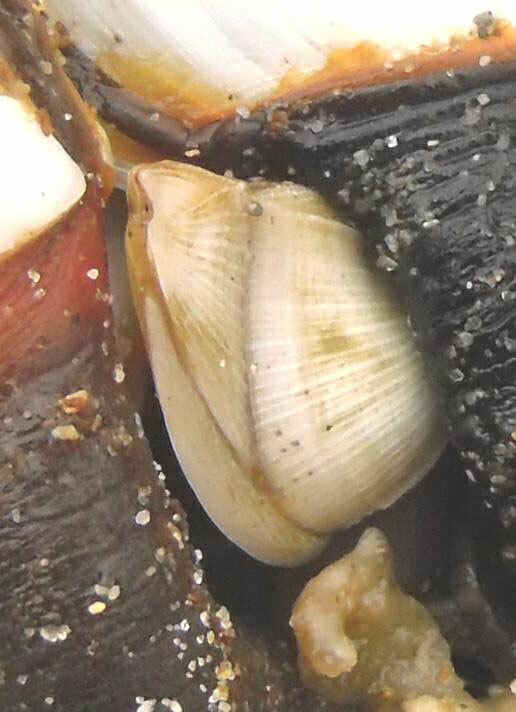 A scour of the strandline between Sennen and Gwenver on the west coast of Cornwall near Land's End discovered about fifty Violet Sea Snails, Janthina janthina, seven dead Triggerfish, Balistes capriscus. and one Gulfweed Crab, Planes minutus, on a polystrene float covered with Goose Barnacles, and two Ray egg cases. 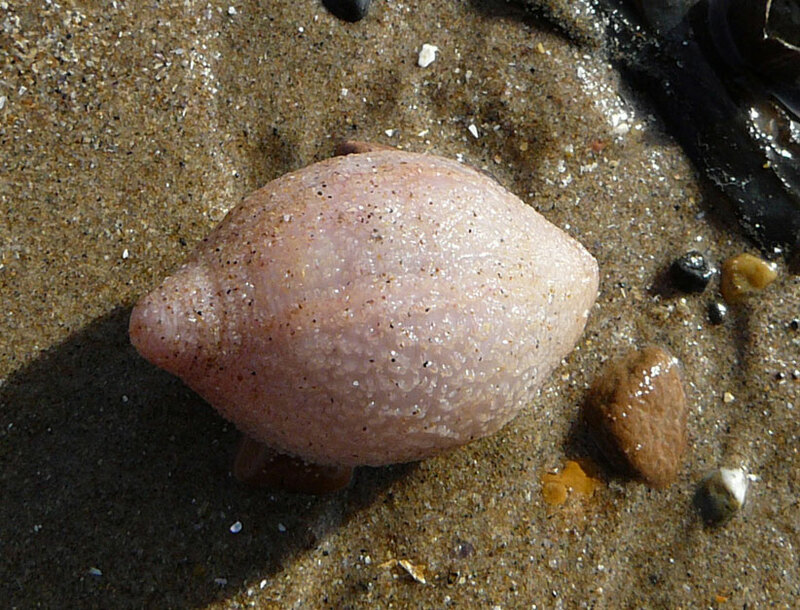 Twenty Violet Sea Snails, Janthina, were discovered along the beach at Woolacombe, North Devon. Most were about 10 mm in size, and some were still alive with their bubble rafts and "inked" when placed in a bucket. 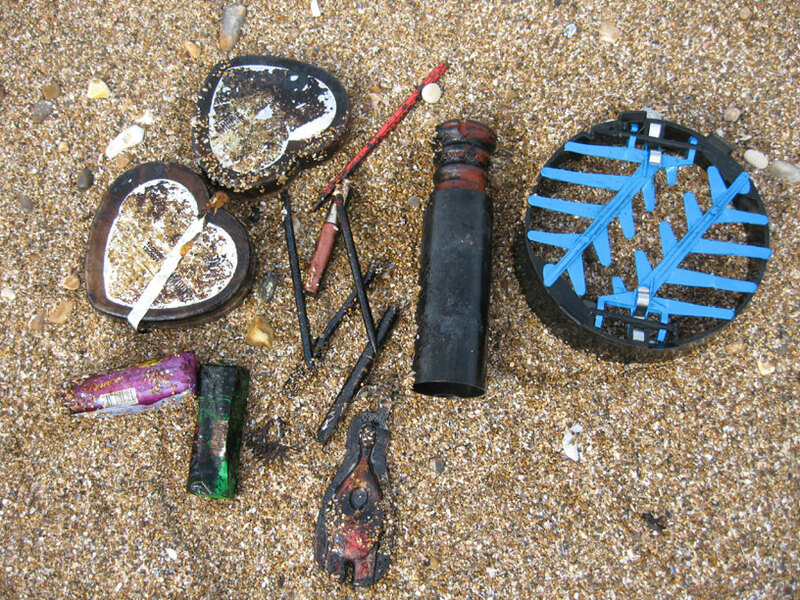 They were washed in with tiny (max 12 mm) By-the-Wind Sailors, Velella velella, Buoy Barnacles, Dosima fascicularis, and a small 15 cm Triggerfish, Balistes capriscus. 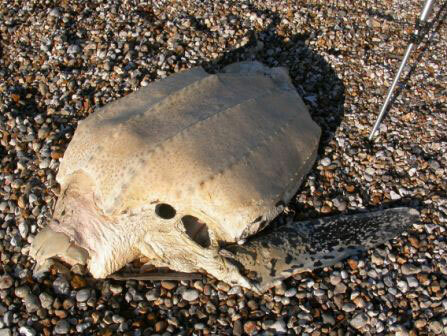 A badly decomposed Leatherback Turtle, Dermochelys coriacea, was washed ashore on Selsey beach, West Sussex. There was much remaining of this large turtle, but the distinctive outer shell and at least one flipper is seen in the photograph by Justin Atkinson. 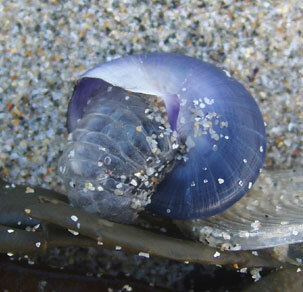 At Sennen, Cornwall, two species of Violet Sea-snails, Janthina janthina and Janthina pallida, as well as two sea beans Entada gigas and Caesalpina bondoc were discovered on the strandline. On the shore at Upton Towans (near Hayle), Cornwall, three Gulfweed Crabs, Planes minutus, (also known as the Floating Crab and Columbus Crab) were discovered living among Goose Barnacle bases on a polystyrene float; and on the second day at Perranporth six of these tiny crabs were found on a plastic barrel and one on a plastic float. The prevailing winds of autumn and the recent gales have washed more unusual pelagic animals on to the shore (with the millions of By-the-wind Sailors, Velella velella, and multiple thousands of Goose Barnacles, Lepas anatifera) notably the small (size of a 10 pence piece) pelagic Columbus Crabs, Planes minutus, with five discovered on the Dorset coast at Southbourne (near Bournemouth) and a further 15 at Hengistbury Head, Dorset. The latter was discovered inside a large shipworm-riddled, Teredo, pole in cavities created by the tiny burrowing mollusc. The Columbus Crabs were found with the Goose Barnacles and there are clues that the buoys, wooden pallets, fish boxes etc. have been floating around the Atlantic Ocean for two years or more and are American in origin. 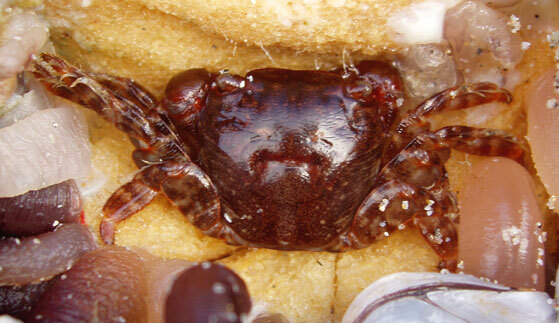 These crabs are rarely recorded pelagic life with British records only from the extreme west coasts, with the only Cornish records of the crab coming from the 19th century. Planes minutus is also called the Gulf-weed Crab because the largest population of this abundant crab is believed to inhabit the open Atlantic Ocean area known as the Sargasso Sea. About a hundred small Goose Barnacles, Lepas anatifera, were seen washed up attached to a broken plastic fish box on the strandline of Shoreham Beach (Ferry Road access) after the recent southerly gales. 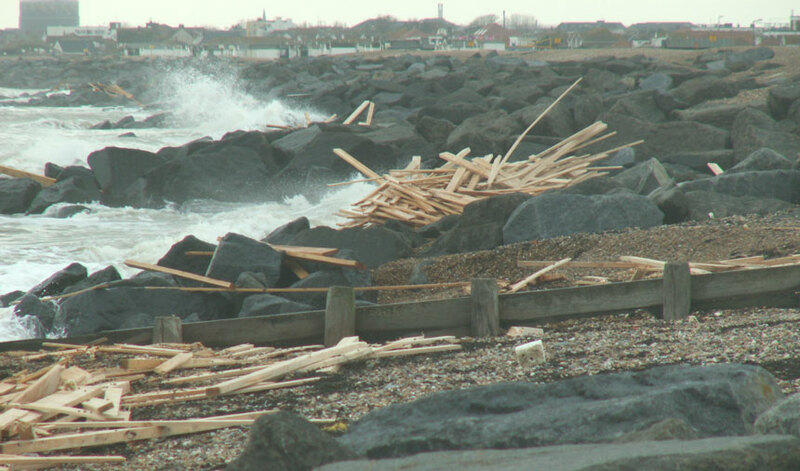 This is the first time I have seen them washed at Shoreham in over 25 years, but I expect they have been washed up and unrecorded before on frequent occasions. 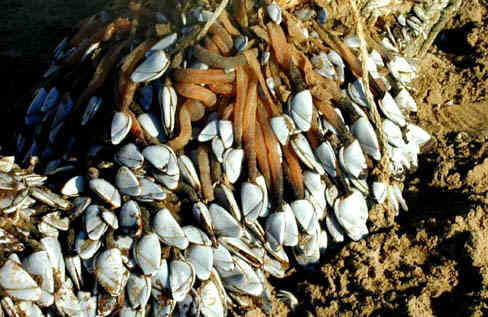 There were the usual millions of Slipper Limpet shells, frequent Whelk and Mussel shells, seaweed and cuttlebones etc. Thousands of By-the-wind Sailors, Velella velella, are washed up on Welsh beaches, notably a narrow but continuous line of Velella velella washed up on the high tide mark at Borthwen, Rhoscolyn, Anglesey (southern end of Ynys Cybi - Holy Island), north Wales (Ian Wright); literally thousands stranded on a small bay at the Mumbles, Swansea (Jess Pitman); a swarm amounting to about two hundred were washed up on Porthllysgi beach off the coast of St. Davids in south west Wales (Eleri Davies); thousands, if not millions, of By-the-wind Sailors washed up on a beach at Criccieth (on the southern coast of the Lleyn Peninsula), Gwynedd, north Wales (Eilir Daniels); and an armada, a thick layer of jellyfish about a metre thick on the strandline in both directions at Cefn Sidan Beach at Pembrey, south west Wales (Bella). I was approximately 5 to 6 miles west of the Casquettes, off Alderney, Channel Islands, and I saw about ten Velella velella being blown past our boat in a few minutes. Buoy Barnacles are attached to floats that they had secreted that have a texture like that of expanding foam. 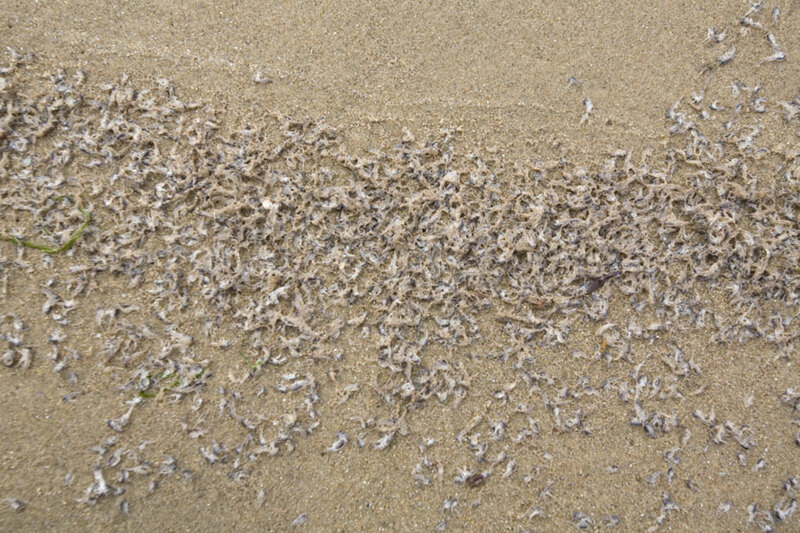 Thousands of the stalked Buoy Barnacles, Dosima fascicularis, are washed ashore on the beaches of Connemara, County Galway, south-west Ireland. They were stranded all along the west coast of Ireland. I found this animal washed up on Blackpool beach, Lancashire. It was so interesting I photographed it. It was unfortunately dead or I would not have disturbed it. It was wet as I washed off dried sand which revealed its beautiful colours. The Runner Crab (or Square Crab), Goneplax rhomboides, is an offshore crab of muddy areas which is occasionally washed up on dead on the strandline. 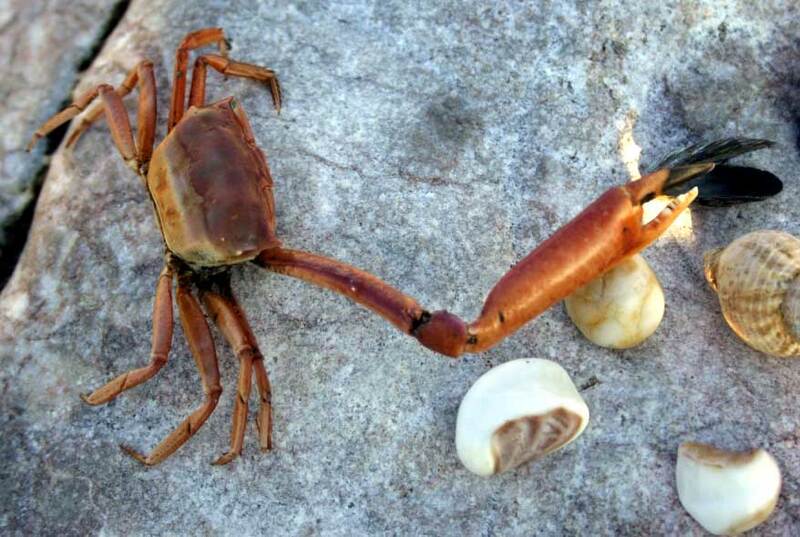 The crab (with a missing claw) in the photograph by Ade Jupp was found washed up at Hythe, Kent, on 24 December 2005. 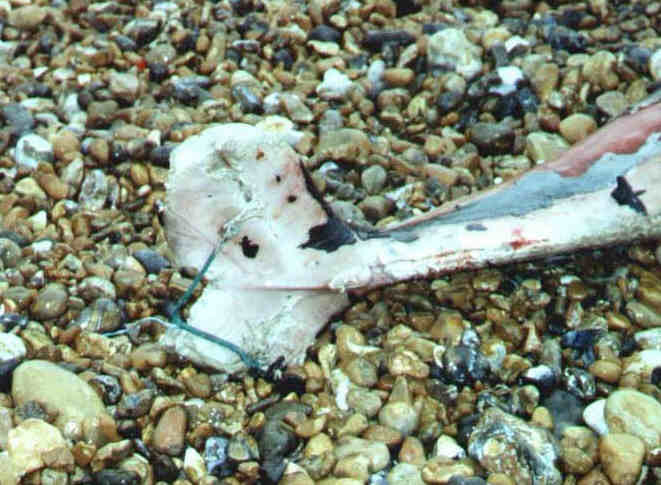 Part of a fish skeleton was discovered on the strandline on Shoreham Beach, Sussex, as shown in the photograph. 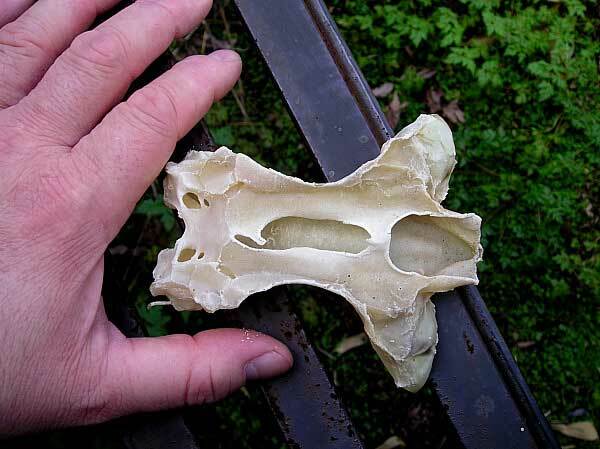 There were at least half a dozen of these skulls of various sizes. The skeleton has not been positively identified, but the best guess is that it is a skull of the Lesser Spotted Dogfish, Scyliorhinus canicula. Hundreds of Sea Cucumberswere amongst the wreck of animal remains discovered on the Dinas Dinlle beach west of Llanwrog (south-west of Caernarfon), north-west Wales. 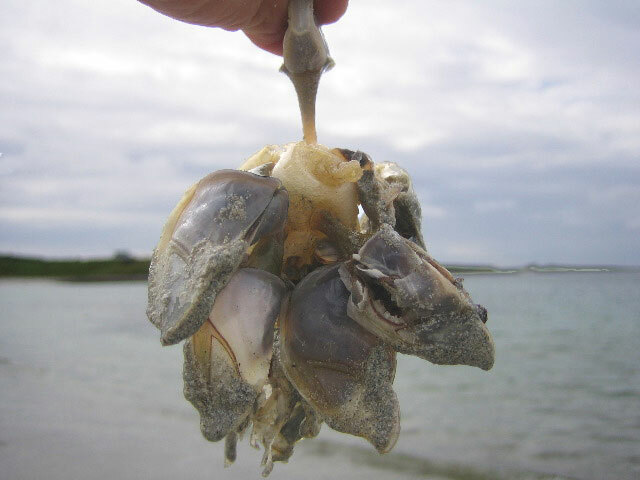 They were scattered all over the strandline and shore with other remains including the common Mermaid's Purses (egg cases of the Dogfish) and the decaying carcass of a dead Seal. Sea Cucumbers are an unusual invertebrate washed up between the tides. They were on the sandy shore adjacent to the Iron Age hill fort. The sea cucumber looks like Thyone fusus can be found as far north as Norway grows up to 20 cm. 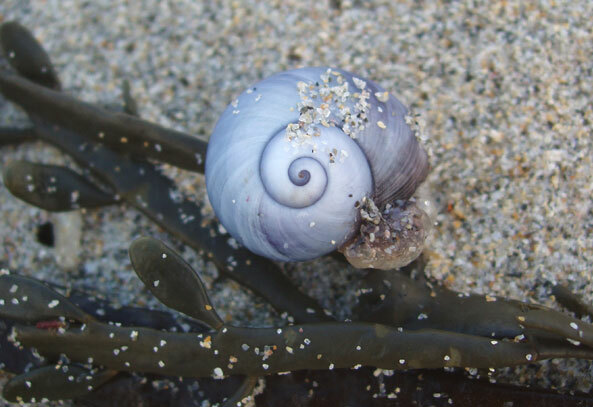 A visit to three shores in northern Cornwall brought the first report of a Violet Snail, Janthina janthina, with the recent spate of By-the-wind Sailors, Velella velella, strandings. Two shells, one alive and one dead, discovered by Julie Hatcher (Kimmeridge Bay Marine Nature Reserve) on Widemouth Bay beach, near Bude. 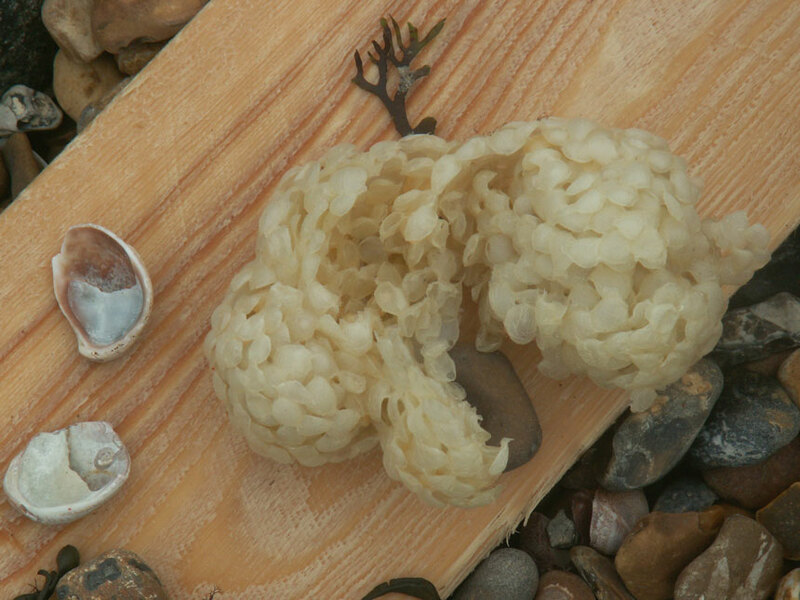 The strandline was covered in the white skeleton shells of Velella several centimetres thick. Not only the shell but the soft body of the Violet Snail is also a violet colour. This gastropod feeds of on Velella and secretes a mucus bubble-raft to keep in buoyant. 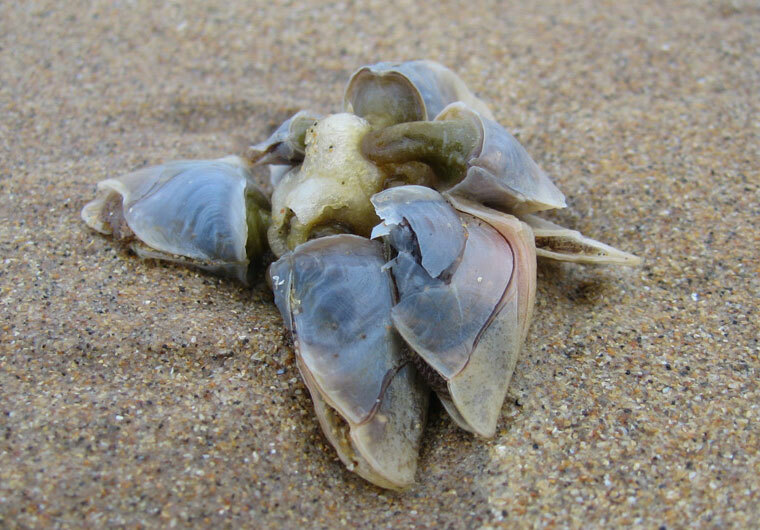 Another animal (a crustacean) that secretes a polystyrene-like raft to keep it afloat is the Buoy Barnacle, Dosima fascicularis, which were present in their hundreds and were still be swept in on to the beach to strand and die. These were more numerous than at least two species of Goose Barnacles, the commonest was Lepas anatifera and the other smaller one washed up was the Duck Barnacle, Lepas pectinata. These two barnacles are always attached to floating debris and are not pelagic, but sessile animals when adult and they become stranded on the shore when the object they attach themselves to becomes dislodged and floats away. 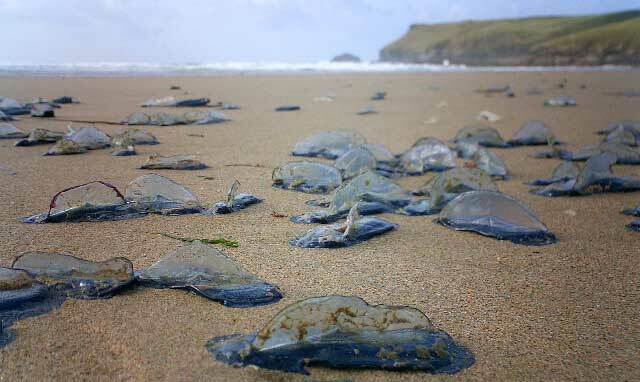 A huge mass stranding of By-the-wind Sailors, Velella velella, occurred all along the north Cornish coast from Sennen Cove (near land's End) up to Polzeath (near Padstow) and beyond. (As the gull flies this is a distance of 25 miles and with all the coves and inlets the shoreline is over double this.) Coming in on the top of the tide, there were hundreds of millions* of them, all large, the largest I found was 85 mm, and all them were intact. 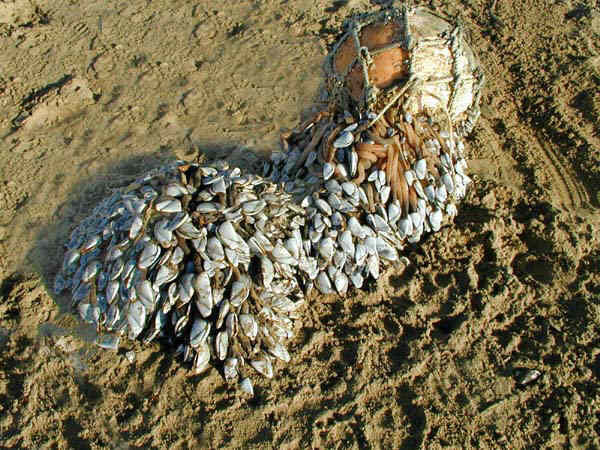 Tens of thousands of Goose Barnacles, Lepas anatifera, were washed up along the strandline. A full skeleton of a small 120 cm cetacean was discovered on the shore at Low Newton, in Northumberland, north-east England. "Millions" of Velella velella, the By-the Wind Sailor were discovered by Nick Darke on Porthcothan Beach, Cornwall. They are freshly dead, the float having the animals or at least fragments of the soft tissue, still present. They are probably all along the north coast, especially at Perranporth, so I will be interested to have an idea of the maximum density per sq. metre. The last really big incursion was in June/July 1981 when Rennie Bere counted 150 to 200 per sq. metre, as they came in on the tide (i.e. not heaped up in catchment areas) and he estimated 100,000 for the stretch of shore at Bude. 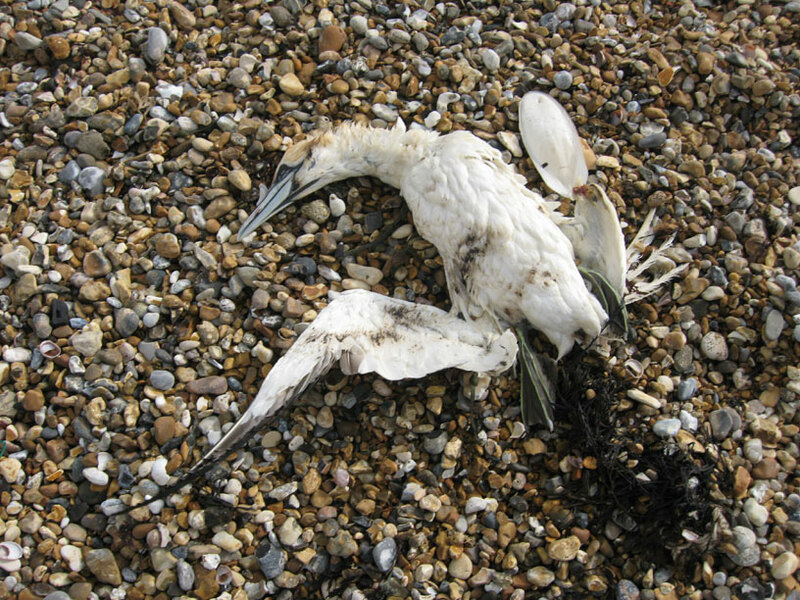 Many By-the Wind Sailor were also discovered washed up further east on the shore at Kimmeridge Bay, Dorset. 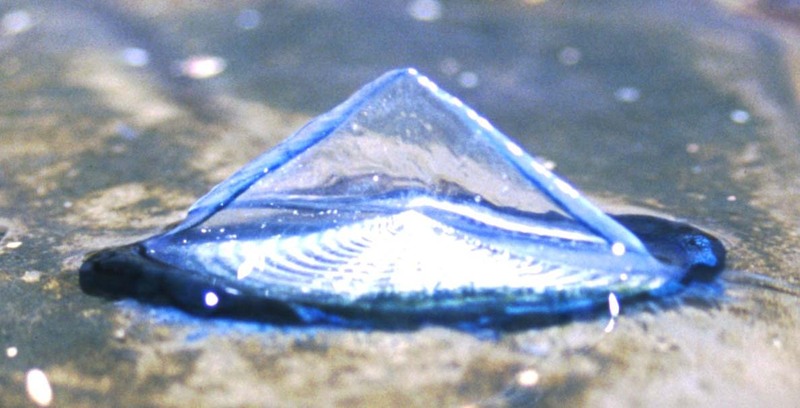 On 30 May 2002 thousands of Velella velella were also washed up along the tide line on the beach at Nicholston Burrows on the Gower peninsular, South Wales. 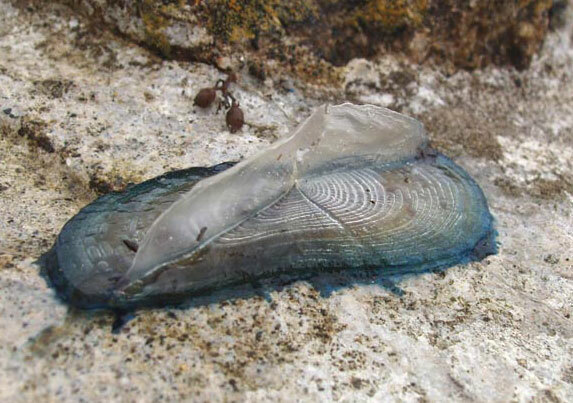 On 2 June 2002 I have had two reports of hundreds of Velella velella being washed up on the South of the Isle of Man, one report from Scarlett Point and another at Chapel Bay, Port St. Mary. 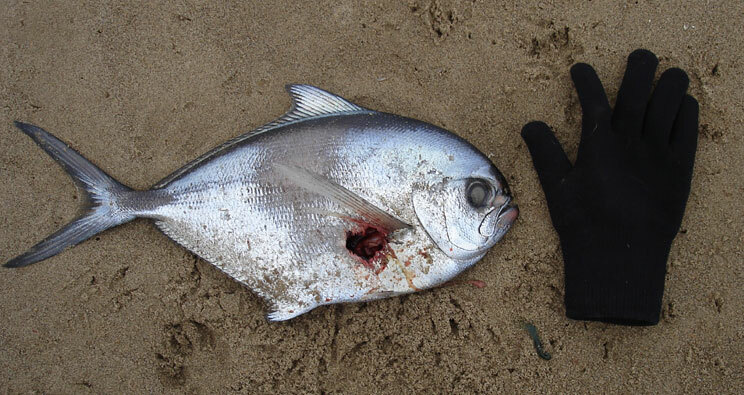 After a sustained period of north-easterly gales, there was amassive stranding of marine animals and weed on the Yorkshire shore (north-east England) between Fraisethorpe and Barmston (East Yorks: Holderness). 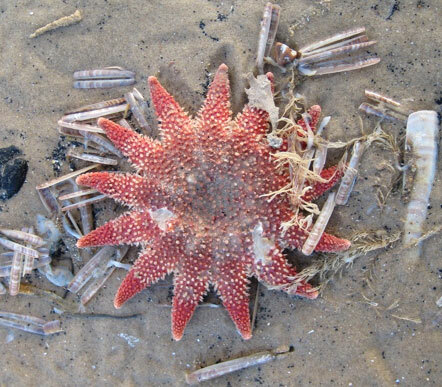 The most noticeable of the animals washed up were hundreds of thousands of starfish mostly of the Common Starfish, Asteria rubens, but other species were present. The list of interesting animals washed up included decapod crustaceans including Lobsters that were still alive, crabs etc., a wide variety of fish, sea anemones, polychaete worms, molluscs including octopuses, porpoises, seals and tonnes of seaweed. This is the largest stranding recording on these web pages. Over the last two weeks Cuttlefish have been found (sometimes by the thousand) on the strandline on both the north and south coasts of Cornwall. Large numbers have also been seen floating on the surface out at sea. On 2 June 2000 Matt Stribley counted over 500 cuttlebones on a 500 metre stretch below Phillack Towans. Two species are involved, mainly the Common Cuttle, Sepia officinalis, and the uncommon Sepia orbignyana (5%) which is smaller and has a pink tinge. The cuttlebones of Sepia orbignyana have longer apical spines (Matt Stribley). A range of sizes of the Common Cuttle have been seen and they are complete, with for example, no teeth marks to indicate that they have been eaten. There seems to be a lot of both cuttlefishes and squids around this year. The Cuttlefish probably could have died naturally after spawning, but there were a large numbers of smaller cuttlebones from reduced sized (juvenile?) specimens. You have to be very careful with the identification of the two cuttlebones. It is the angle of the spine that is important and you will have to go to Matt Stribley's site below to see the small detail. 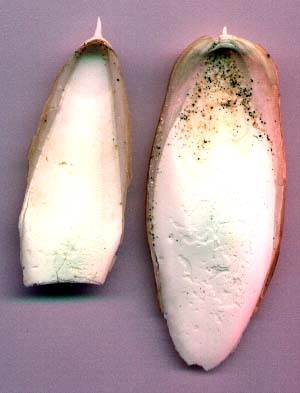 In old specimens of Sepia officinalis the cartilage on the outside of the cuttlebone can break away and then the shape will resemble that of Sepia orbignyana. 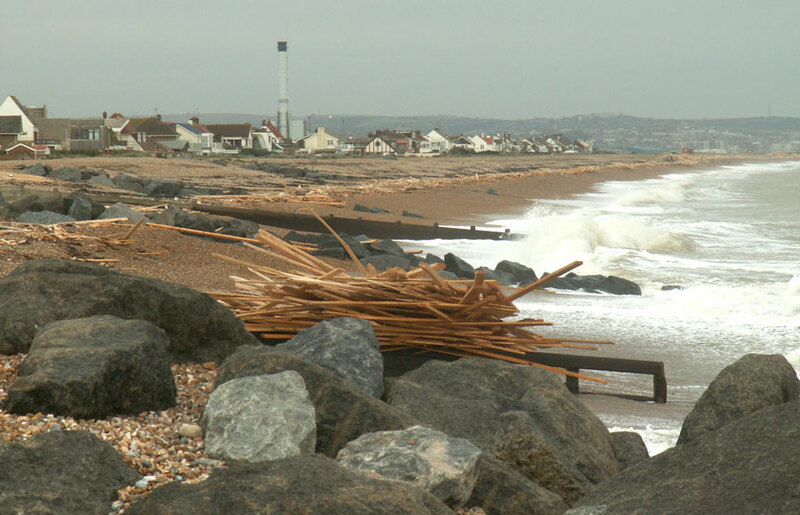 The winter months are not all that productive on the strandline of Shoreham beach, even after storms, as the sea scours the shingle beach and takes the deposited marine remains back out to sea and inreasingly eastwards with the longshore drift. Scattered amongst the weed there were the omnipesent Slipper Limpet shells, with more Oyster shells than normal and the battered remains of Lobster, Spiny Spider Crabs, and the inevitable cuttlebones. All were of the Common Cuttlefish, Sepia officinalis. 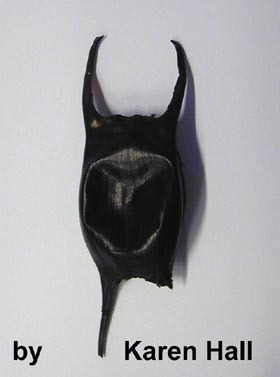 An egg case of the Skate was blown inshore and a fully intact Lesser Spotted Dogfish had not yet been spotted and scavenged by the gulls. I've been picking up something from the tideline for a few years , that I've always assumed to be a weed, possibly Furcellaria fastigiata or maybe Polyides rotundus but I took a good healthy specimen with me today and Peter Hayward put it under an electron microscope. When I saw it magnified, the spores were obvious, making it a sponge growth that looks like a plant. Peter identified it as Haliclona oculata. 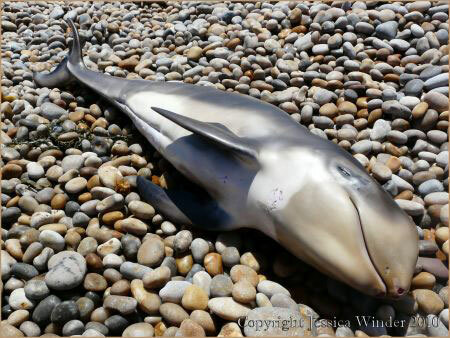 Two badly decomposed Dolphins were washed up on Shoreham Beach, Sussex. 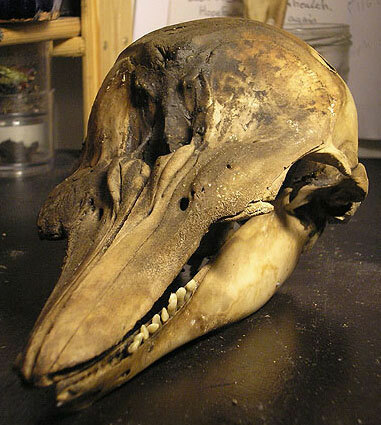 They were badly decomposed but were probably Common Dolphins, Delphinus delphis. 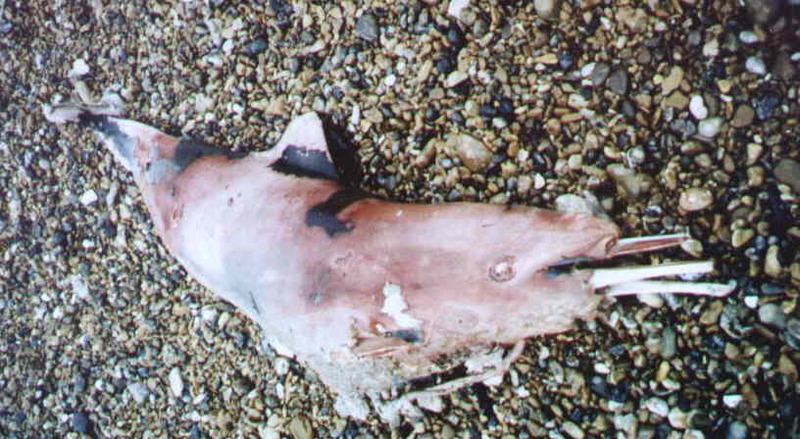 A Porpoise, just over a metre long, was washed at nearby Worthing. people thought it was more extreme than usual I thought you might be interested. After a few days of gales, I discovered my first Goose Barnacles, Lepas anatifera,on the Gower peninsular, south Wales, storm shore at Llangenith, after 25 years of searching the strandline. These are the barnacles in the photograph on the right and they varied in length rom 25 mm length down to small baby ones of 5 mm - 8 mm. On the beach from Sutton-on-Sea up to Mablethorpe, East Lindsey (Easy Yorkshire), we noticed thousands of dead starfish ranging from 3-10 cm in size, along with large numbers of dead crabs and some small shellfish. The starfish were almost certainly the Common Starfish, Asterias rubens. This stretch of coast seems to be particualrly prone to large and massive strandings of starfish and other marine life. 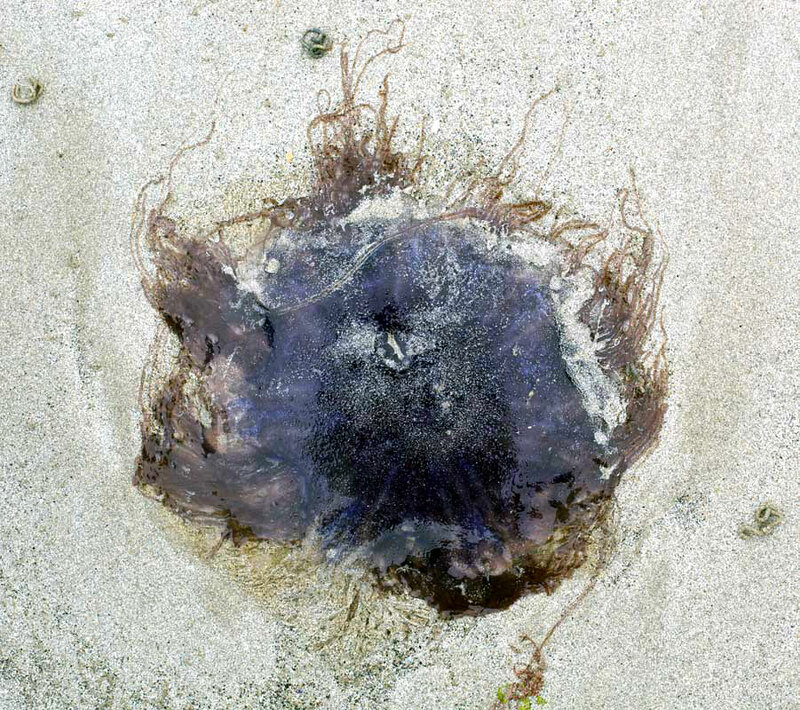 There was a mass stranding of 500+ Mauve Stingers (small jellyfish), Pelagia noctiluca, at Porthcothan, Cornwall.This is the most unusual of the British species of pelagic jellyfish to wash up, but large swarms occur in years of abundance. Despite being a small jellyfish, it has a reputation as a stinger, in the Mediterranean. Amongst the Sea Rocket, Orache etc, on the strandline, aPeanut Plant has taken root. Masked Crabs, Corystes cassivelaunus, are found often found washed up on the sandy areas of the beach.